As we saw a couple of weeks ago, plastic packaging may not be as innocent as it seems. But hey, all of this worry could be for nothing, as it appears that soon there might not even be a need for traditional packaging. Enter, the latest crazy concept from the 'new food invention' drawer - WikiPearl. As much as it pains me to say, the WikiPearl product is best summed up by the company's own slogan - 'delicious food wrapped by nature'. The concept involves balls of food, stuffed with different fillings, including yoghurt, cheese etc. and all wrapped up in an edible coat. Yep, just as in the the way foods like cheese form a natural protective layer to encase and preserve the goodness within, WikiPearl aims to do much the same. After years of hard work following the idea's conception in Harvard's world renowned classrooms, WikiPearl founders David Edwards and Francois Azambourg went about developing their environmentally friendly and groudbreaking approach to food preservation. Their food packaging-focused aim? Simple; don't have any, at least not in the traditional sense. The mouthwatering treats seen above are just one of the newly emerging WikiPearl products. 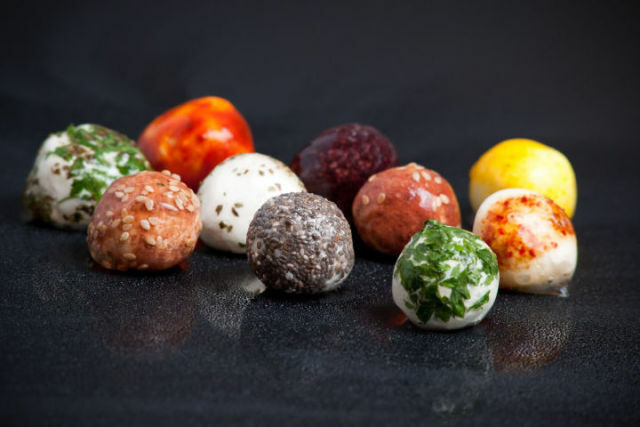 In addition to experiencing yoghurt all wrapped up in an edible skin, also on their way are cheese cubes and gourmet coffee, to join the already established mini ice cream balls. 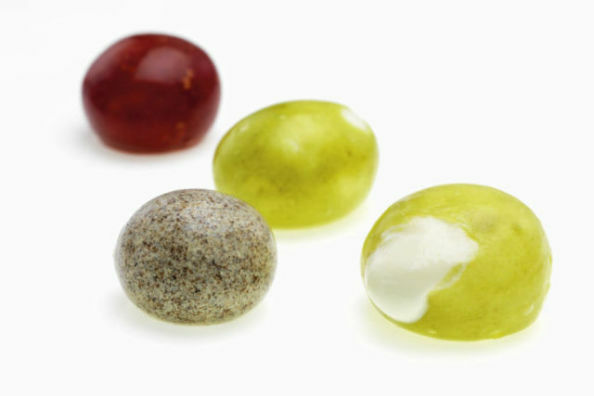 Indeed, with a brilliantly innovative and green product in their arsenal, it seems inevitable that the WikiPearl food invention will go from strength to strength as new variations emerge. As can be seen below - in Engish, and in French if you're feeling brave - Paris has recently seen the launch of this exciting new product. Referred to by one of the co-founders himself as a 'baby', the product will initially launch in France and the United States, before no doubt attempting to conquer the world with its new take on environmentally friendly food packaging. 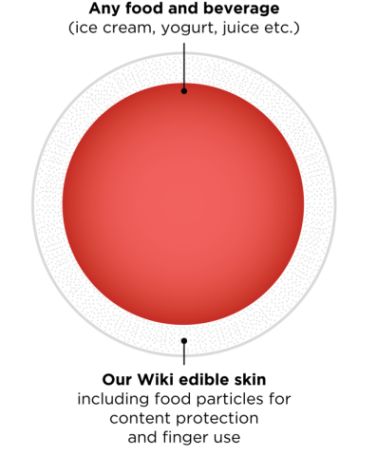 Given the impeccably clear and explanatory diagram found beneath, this seems like the perfect time to delve into the deliciously complex mechanisms behind WikiPearl. The company's WikiCell technology harnesses the magic offered up by the humble grape skin to create edible and food preserving coats, which in addition to keeping food free from those troublesome bacteria, also pose zero threat to the environment. So whilst the minds behind the invention are keeping the detailed ins and outs close to their chests, the science at work is essentially seeking to recreate natural preserving shells such as those found around various fruits and vegetables. And so the question must be asked; are there any downsides to this product? Well, as far as I can see, the only disadvantage of this product lies with its limited range. Indeed, as a newly launched concept, the product range is far from astounding, although there are some enticing treats under the 'coming soon' banner. With this said however, I am pretty sure that we can forgive this understandable shortcoming, and instead look forward to a day when many of our favorite foods will come in the form of delightful WikiPearl balls. Although currently only available in Paris, and as yet still to jump on the online bandwagon, WikiPearl products can be bought in person, with prices available here. So of course we must end with the inevitable question; which food would you wrap in a mother nature-provided skin? Ahhhh the possibilities!